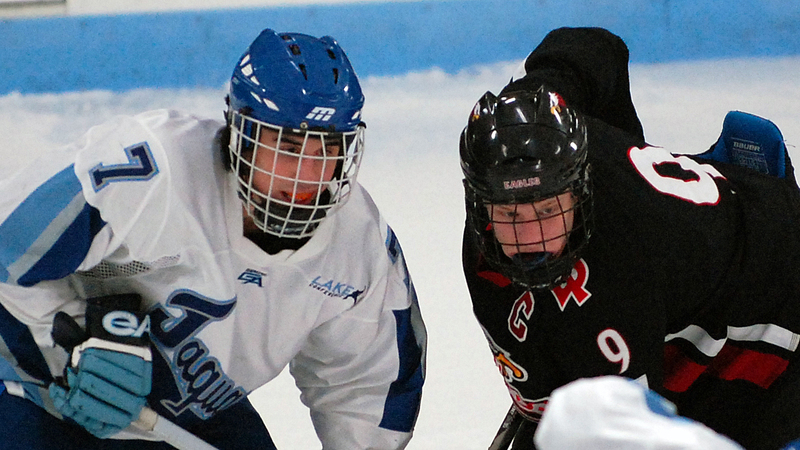 Kyle Rau had at least three breakaways. Maybe four. 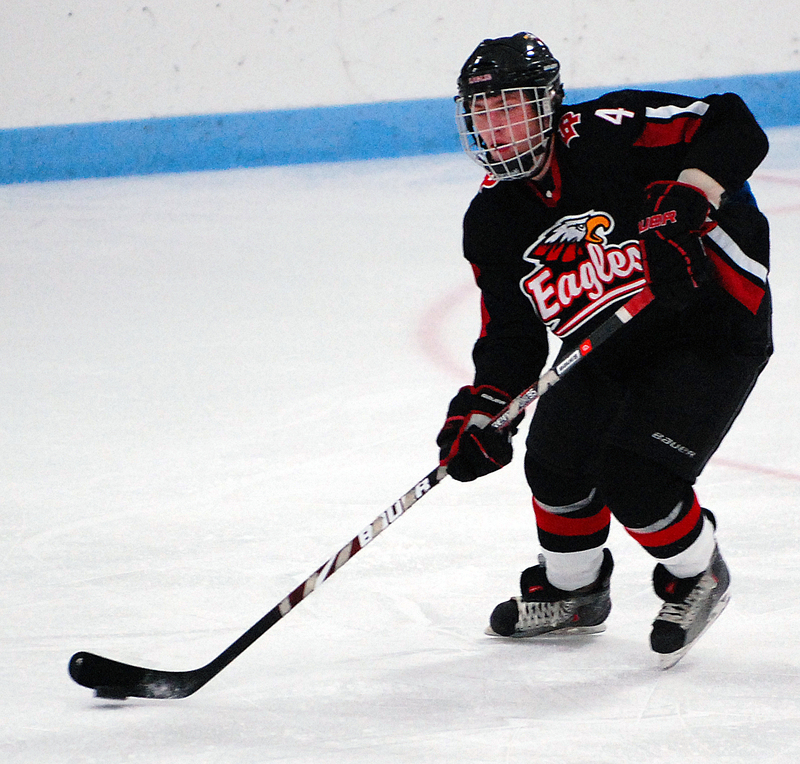 Rau, Eden Prairie’s goal-scoring phenom, had his first solo rush in the game’s opening minute. 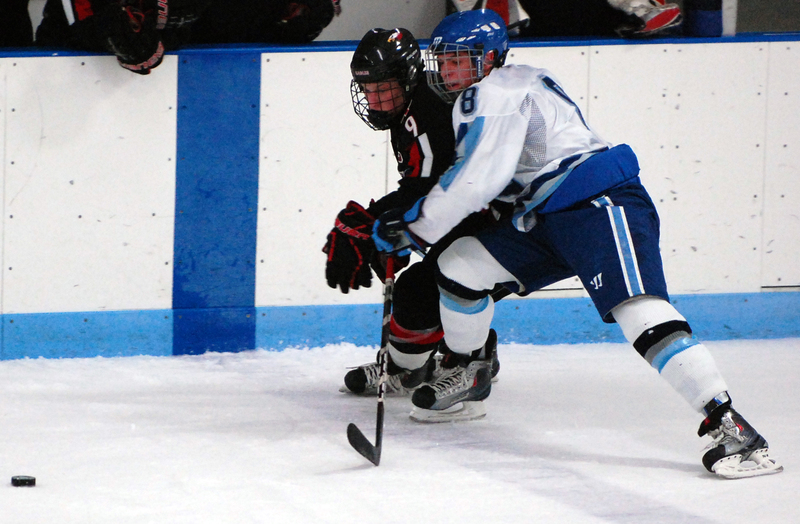 Bloomington Jefferson sophomore goaltender Eric Fabano calmly directed the puck away with his right leg. And so went the rest of the game. 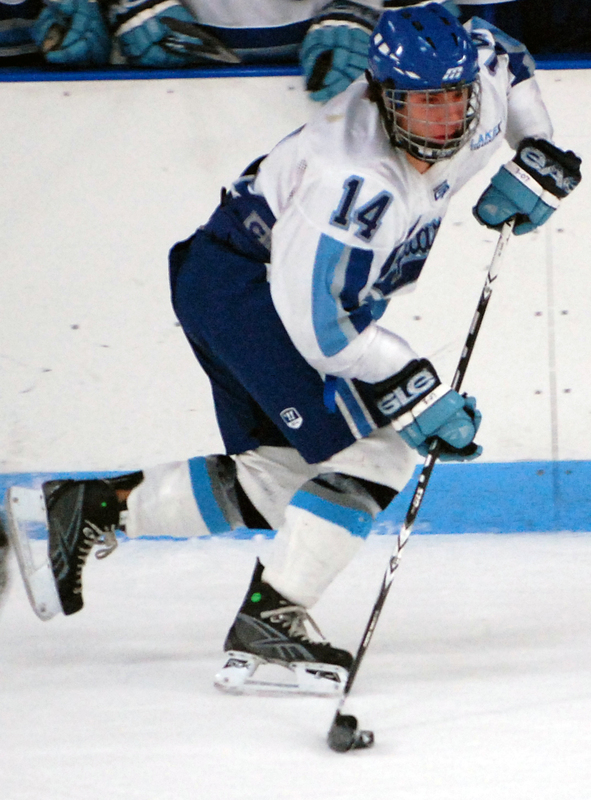 Rau breakaway! Fabano with the stick save! Rau on the breakaway! Fabano with the blocker! “I couldn’t score,” Rau said. 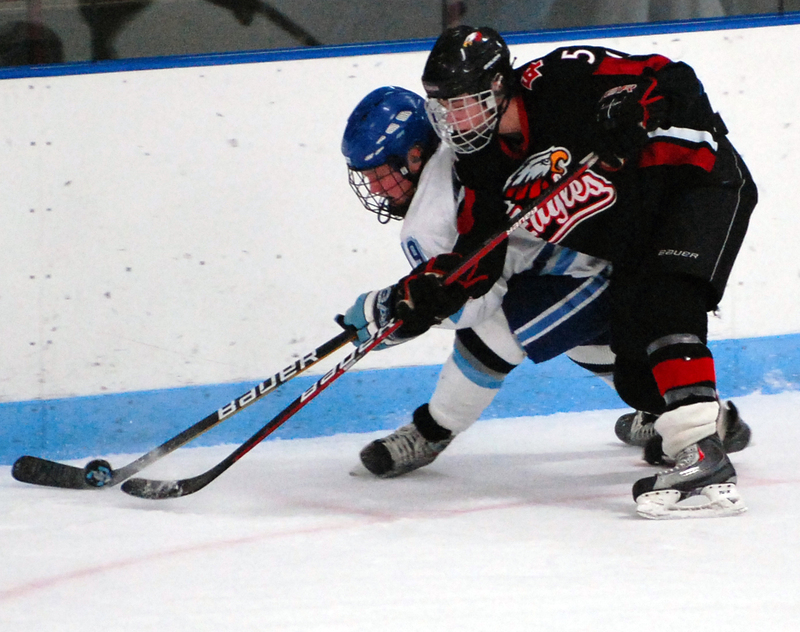 With Eden Prairie trailing by a goal late in the third period, Rau was standing behind the Bloomington Jefferson net when he made what he intended to be a pass to linemate Mitch Rogge. Except the puck never got to Rogge. 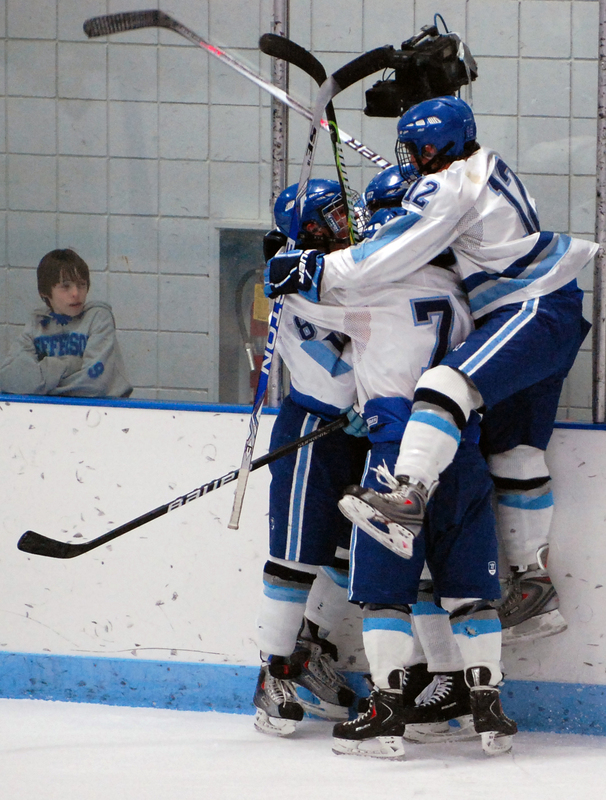 Instead, it banked off a Bloomington Jefferson defenseman’s skate and into the net. Rau’s “misfire” tied the score at 3 with 3 minutes, 33 seconds left in regulation. 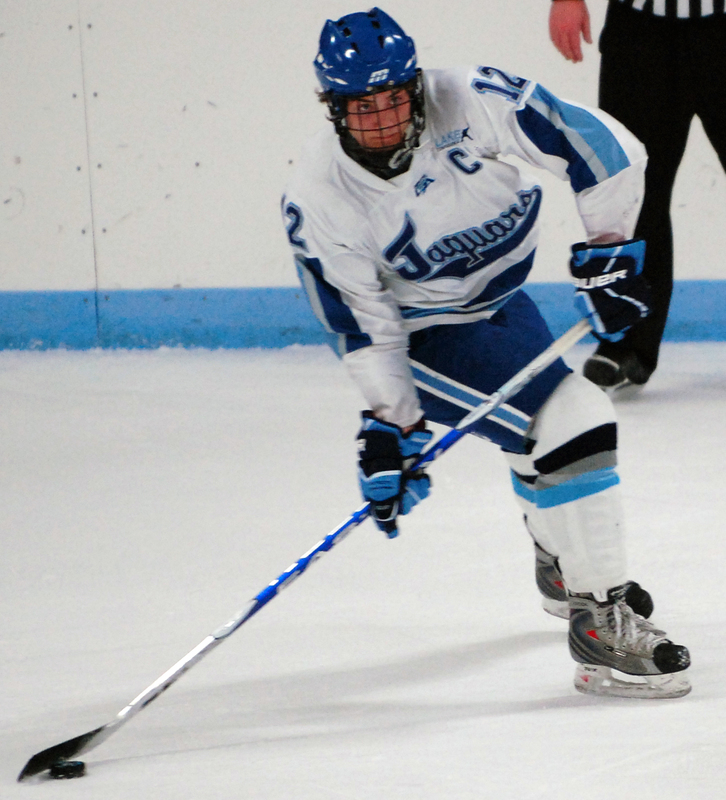 “Pure luck,” said Rau, who ranks fourth in the state with 36 goals. 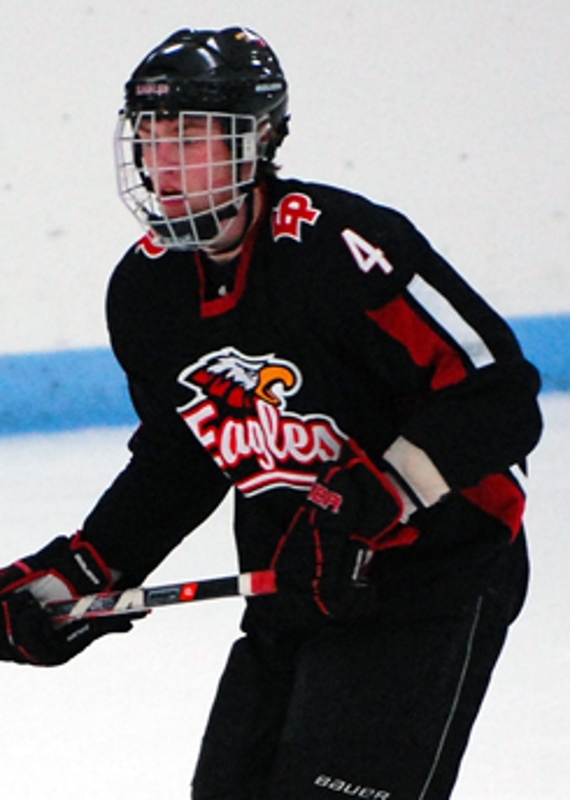 Junior defenseman Dan Molenaar, the one Eden Prairie player who seemingly had no problem solving Fabano, scored on a low shot from the point just 29 seconds into overtime to give the Eagles the 4-3 Lake Conference victory on Thursday, Feb. 11 in front of an estimated crowd of 1,300 at the Bloomington Ice Garden. 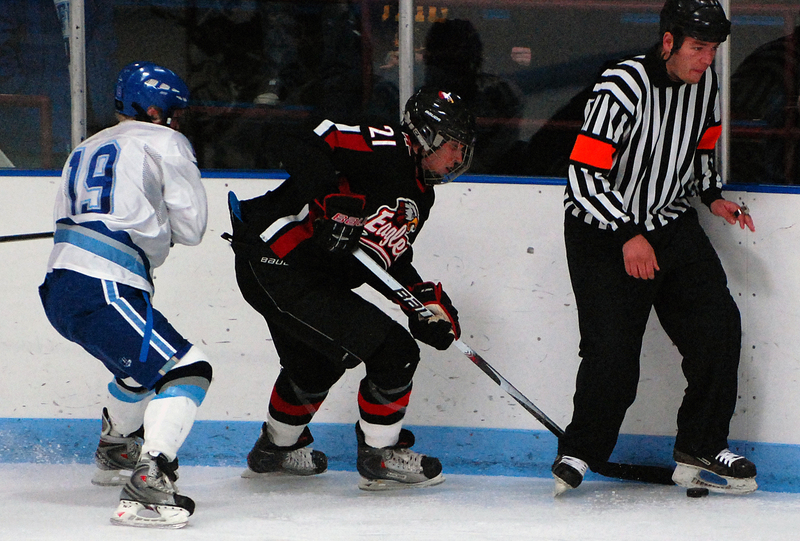 The winning goal finished off the hat trick for Molenaar, who banked his first goal in off the goalpost, scored his second on a half-whiff knuckleball and finished off the trifecta of long-ranging scoring (all his shots originated from the blue line) in overtime by drilling the ice-level shot that somehow made its way through a maze of players before sliding under Fabano. The loss was about as disheartening as one could can be for the Jaguars (12-4-1 in conference, 17-4-2 overall), who are ranked No. 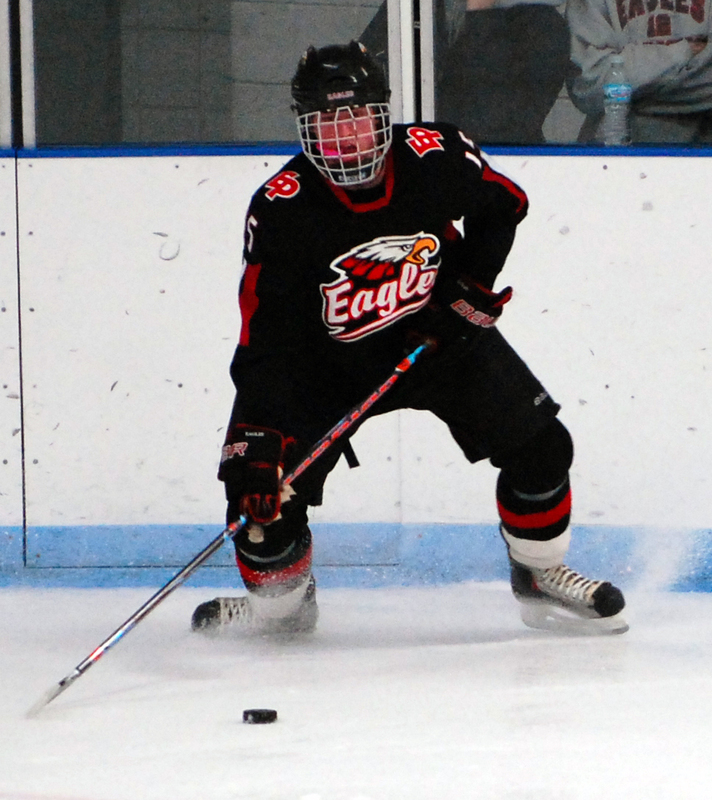 6 in Class AA, one spot behind the defending state Class AA champion Eagles (13-2-0, 16-4-1). 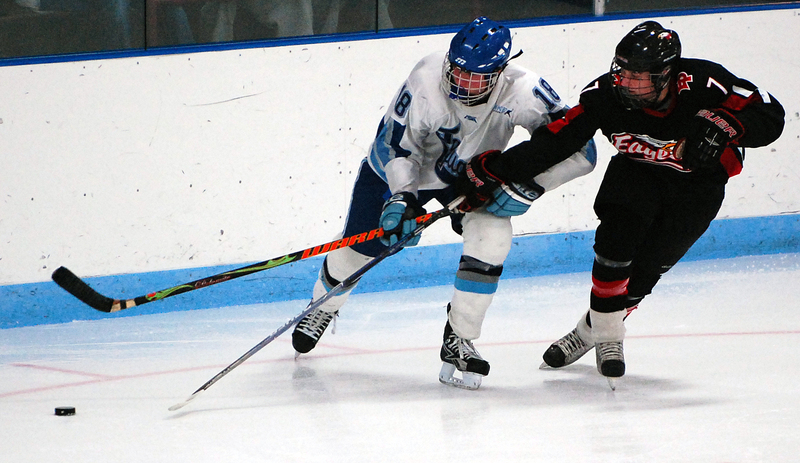 Bloomington Jefferson seemingly had the game in control after taking a 3-1 lead after two periods. 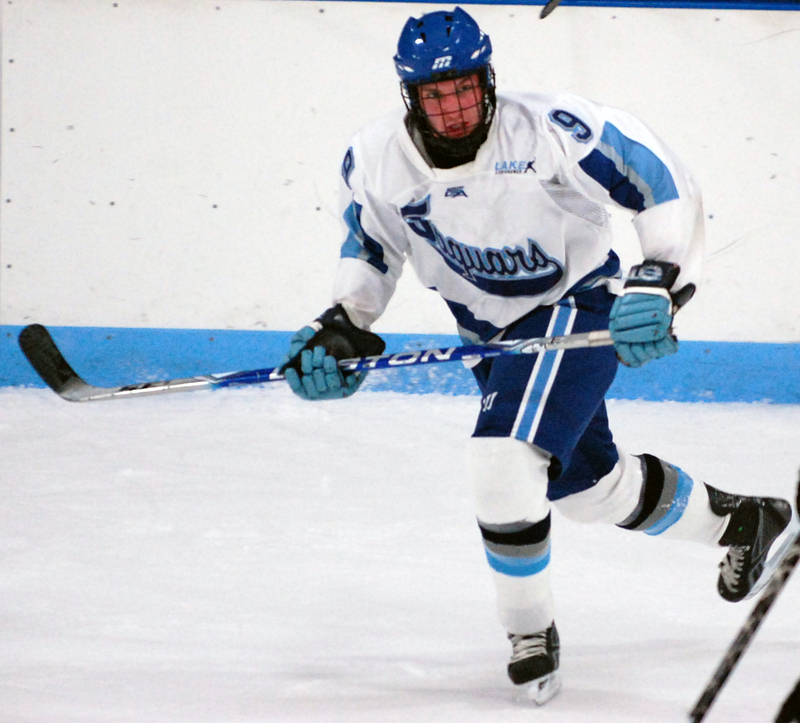 “We had them for a while there,” said Jaguars center Caleb Herbert, who on Thursday was named as one of 10 Mr. Hockey finalists. “We just let it slip at the end, and they just took the game from us. We’re just going to bounce back here and learn from our mistakes. 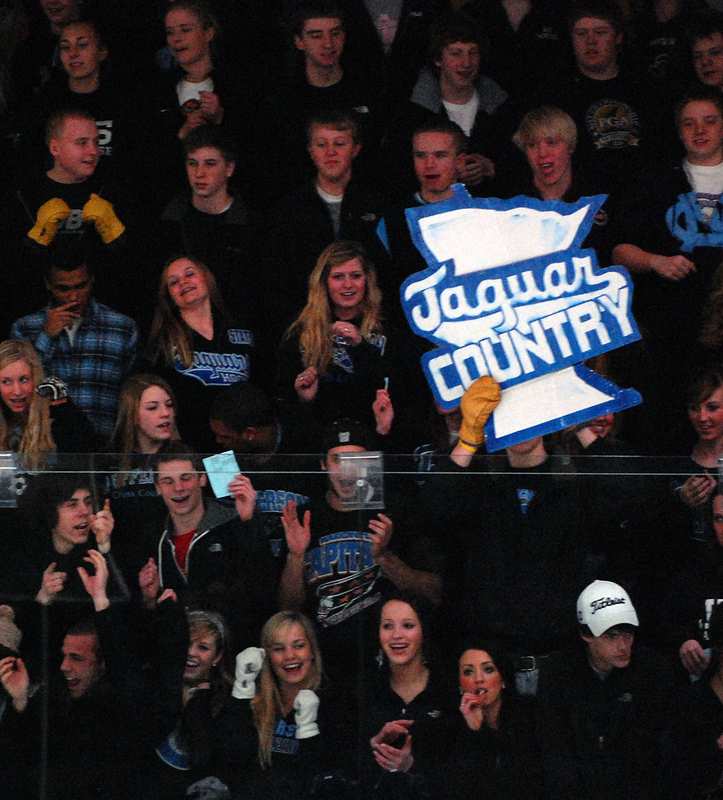 The Jaguars’ lead entering the third could have been even bigger if not for the play of Eagles goaltender Andrew Ford. 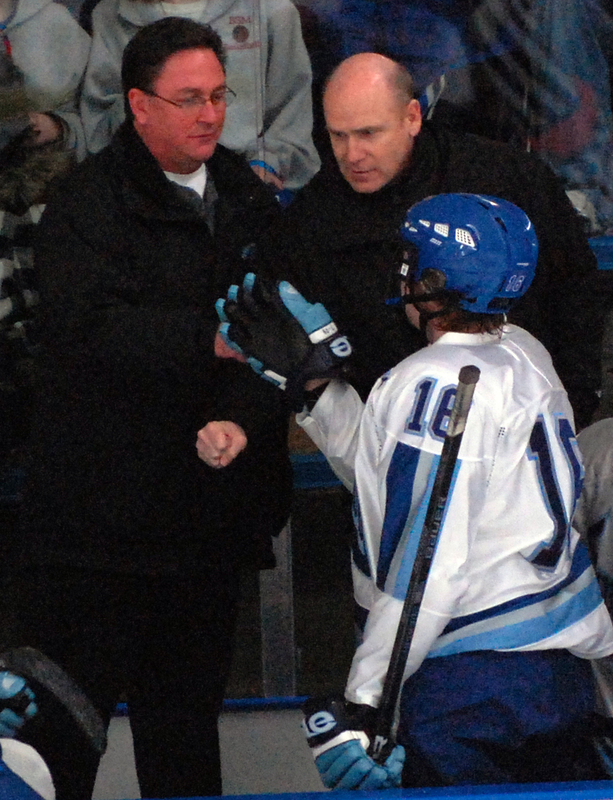 “I thought our kids played great,” Bloomington Jefferson coach Jeff Lindquist said. “They played solid. We just didn’t finish. 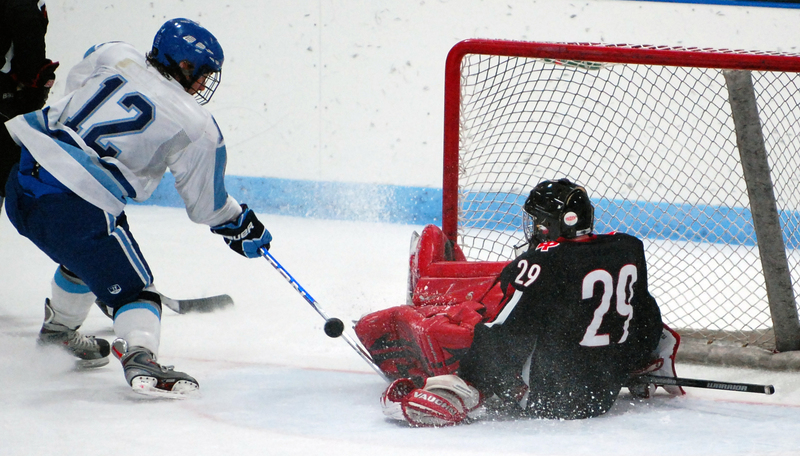 Like Eden Prairie and Rau, Jefferson had numerous point-blank scoring opportunities snuffed out by great goaltending. And, like Fabano, Ford was the victim of a weird goal when he made an initial save on a Tyler Dietzler shot but then lost sight of the puck as it shot straight up toward the rafters. 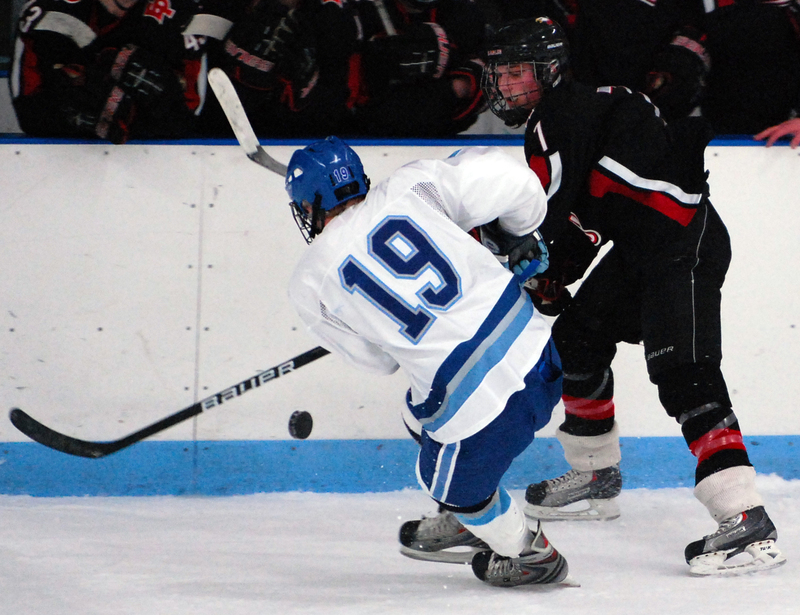 When the puck finally dropped, it did so behind the back of Ford and into the net. While Ford came into the season with an established reputation (he was, after all, the starter on last season's state championship team), Fabano is still building his. He has started only eight of the Jags’ 23 games, but he has been getting more and more playing time as the season has progressed. 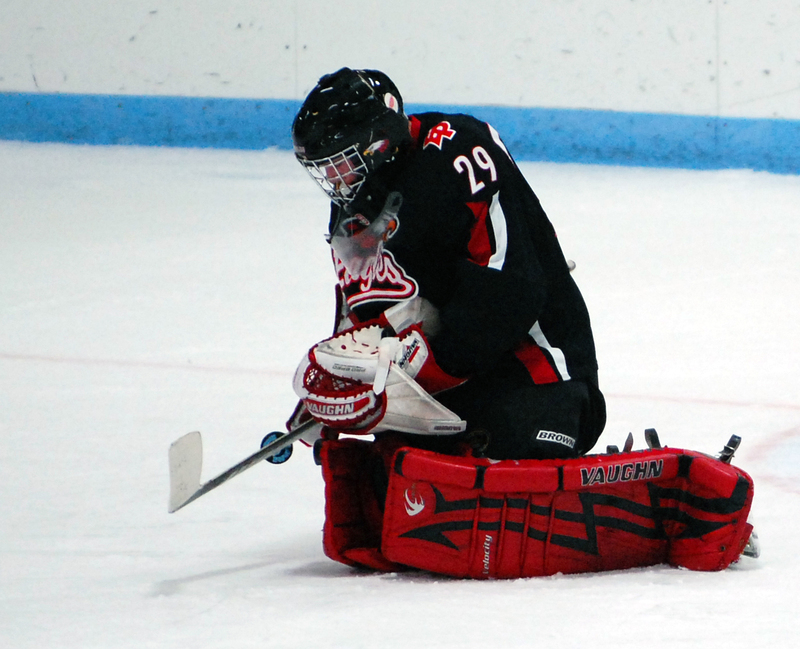 Fabano was the starter in wins over Eagan and Moorhead last week and has a sparkling .913 save percentage to go with a 1.76 goals-against average. “He played a great game,” Herbert said. “On the defensive end of things we kind of left him hanging a couple of times there, getting in his way with some of those point shots. 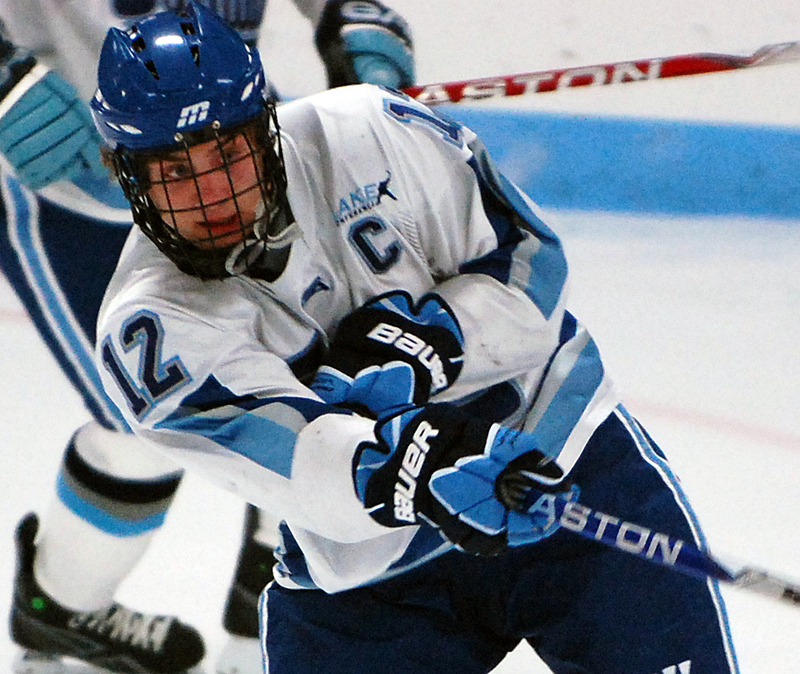 Picking the first star (Molenaar, a junior, is pictured below) never has been this easy. 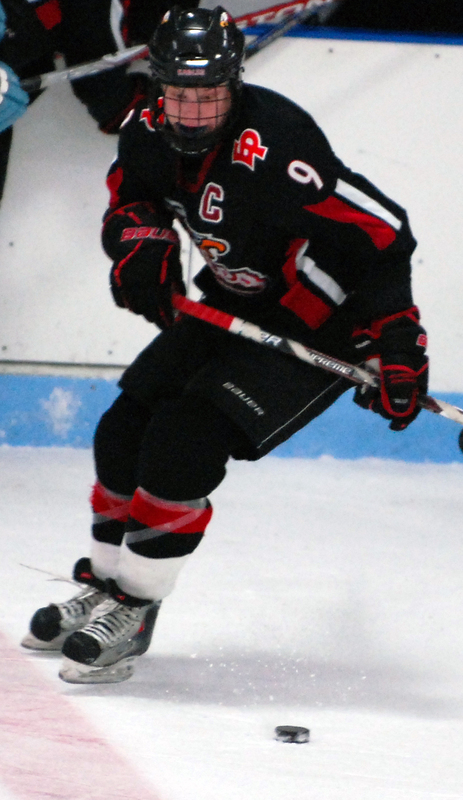 A defenseman finishing off his hat trick in overtime. Are you kidding? Molenaar's shots from the point must have had some sort of homing device on them, because they all found their way through heavy traffic to the back of the net. 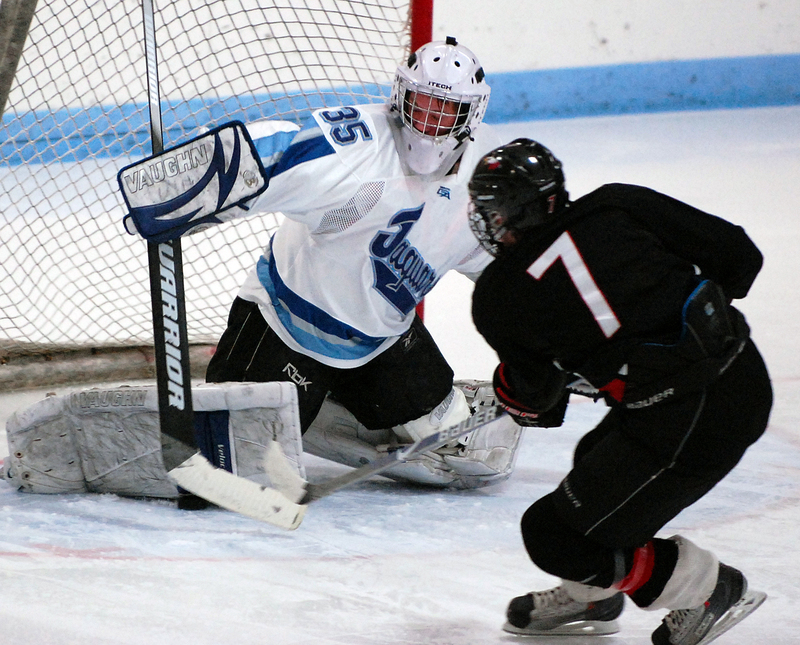 Sophomore goaltender stopped super sniper Kyle Rau on not one, not two but three breakaway chances. Fabano couldn't be faulted for any of the Eagles' goals and that includes -- especially -- the tying goal. Rau was behind the net and merely passing the puck to a teammate when it glanced off a Jaguars' player's skate and into the net. Talk about bad luck. 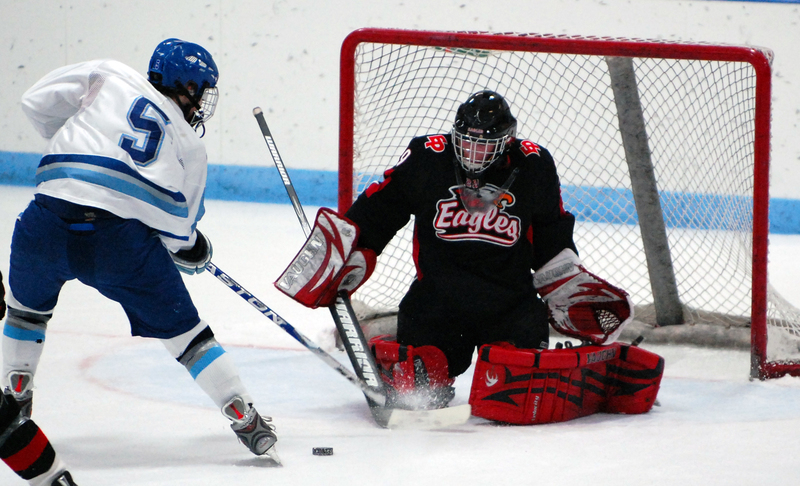 Eagles goaltender stopped numerous point-blank Jaguars shots in the first period and the first half of the second when Jefferson repeatedly caught the normally stout Eden Prairie defense flat footed. Like Fabano, he gave up a flukey goal when a shot glanced off his shoulder, sailed straight up and, after what seemed like an eternity, dropped behind him and into the net. 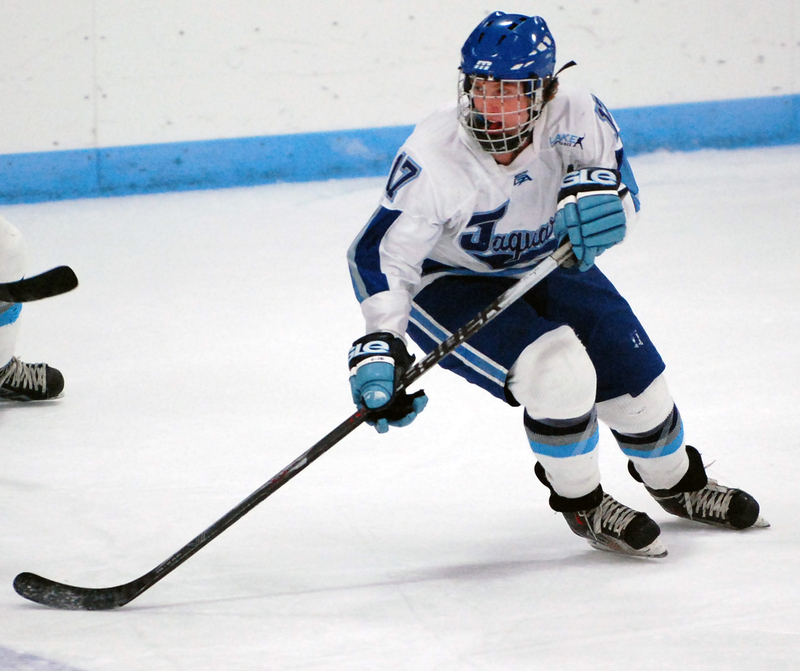 Bloomington Jefferson senior Caleb Herbert was one of the 10 Mr. Hockey finalists announced on Thursday. The annual award goes to the outstanding high school senior in the state. The winner will be announced the Sunday after the state tournament. 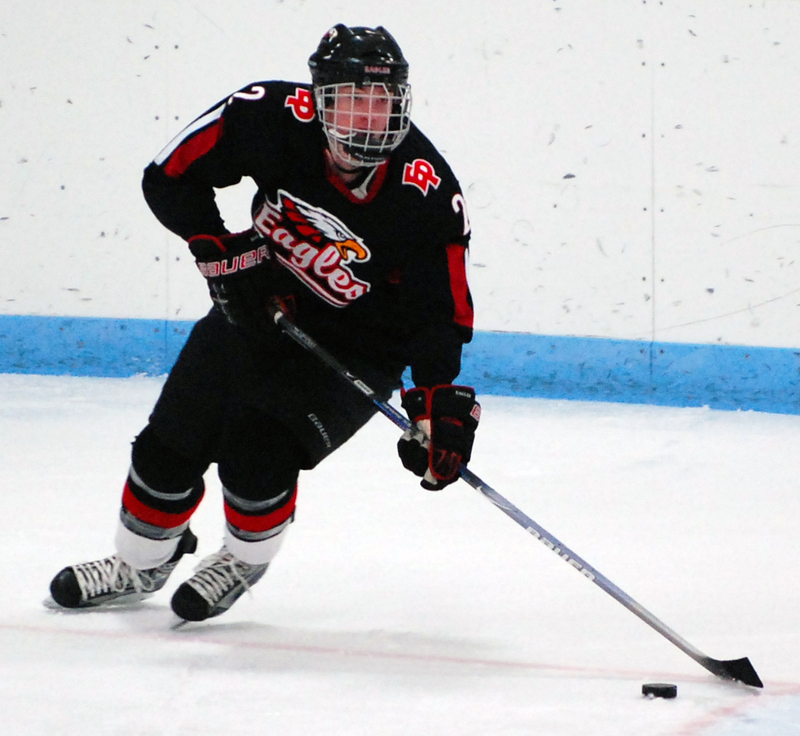 Eden Prairie junior Kyle Rau entered Thursday's game against Bloomington Jefferson with 35 goals, almost twice as many as the next best Eagles goal scorer, linemate Mitch Rogge (18). 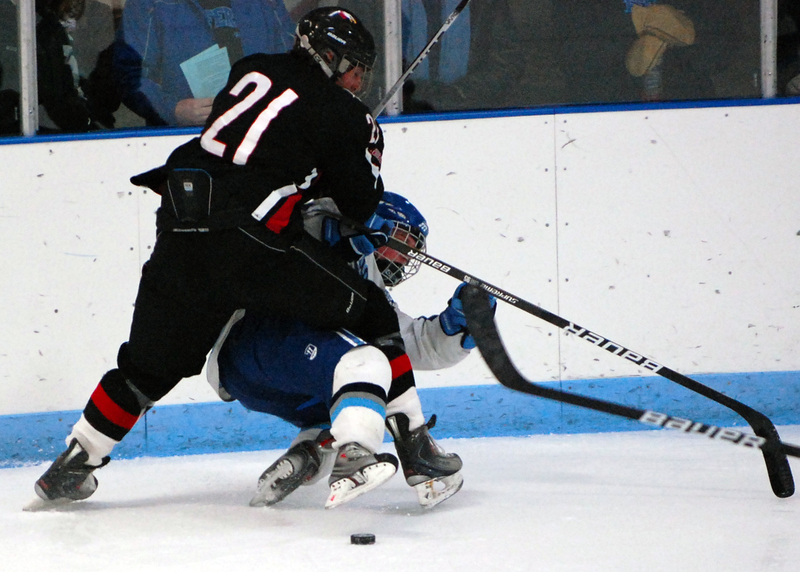 Eden Prairie's Rogge rang a shot of the right goalpost five seconds into the game, and Rau had a breakaway attempt denied by right leg pad of Jefferson sophomore goaltender Eric Fabano just a few seconds later. 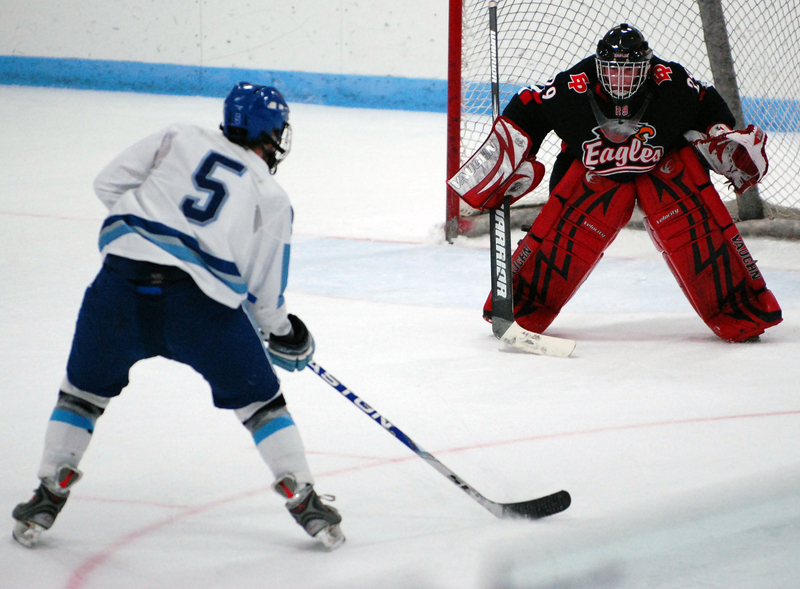 After the first shift, however, the Jaguars had the better scoring chances as they repeatedly snuck behind the Eden Prairie defense and fired an array of close-range shots on Eagles goaltender Andrew Ford.